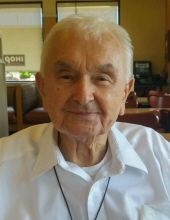 John William Morin (Marin) 98 passed away in Oak Ridge, Tn. formally of Cleveland, Ohio. He was born May 18, 1920 in Malvern, Oh. He was the owner of Quality Spring and Wire. A 32 nd Degree Mason ; Past Master, Secretary , and 60 years member of his Lodge in Ohio. He served as an officer and Trustee of St. Mary Roumanian Orthodox Cathedral and Chairman of its Boy Scout Troop in Cleveland. He was a World War 11 Veteran . He is survived by his wife, Victoria (nee Amnasan); son Dr. Garrison (Col. R'td USAF) ( Sheila) of Virginia; Dr. Garnetta Morin-Ducote ( Joey) of Knoxville; Delora Stelly (Dr. Chris) of Florida; Melanie of Arkansas and six grandchildren. Elizabeth and Tara Morin; Matthew and Megan Ducote; Christina and John Stelly. He was preceded in death by sisters Mary Brady Stefan and Helen Popdavid. The funeral service will be held Friday, November 9, 2018, 9 AM, St. Anne Orthodox Church, 560 Oak Ridge Turnpike, Oak Ridge, TN. Father Stephen Freeman will officiate. The graveside service will follow at 11:30 AM at East Tennessee Veterans Cemetery in Knoxville. Military honors will be provided by Tennessee National Guard Honor Guard. To send flowers or a remembrance gift to the family of John William Morin, please visit our Tribute Store. "Email Address" would like to share the life celebration of John William Morin. Click on the "link" to go to share a favorite memory or leave a condolence message for the family.